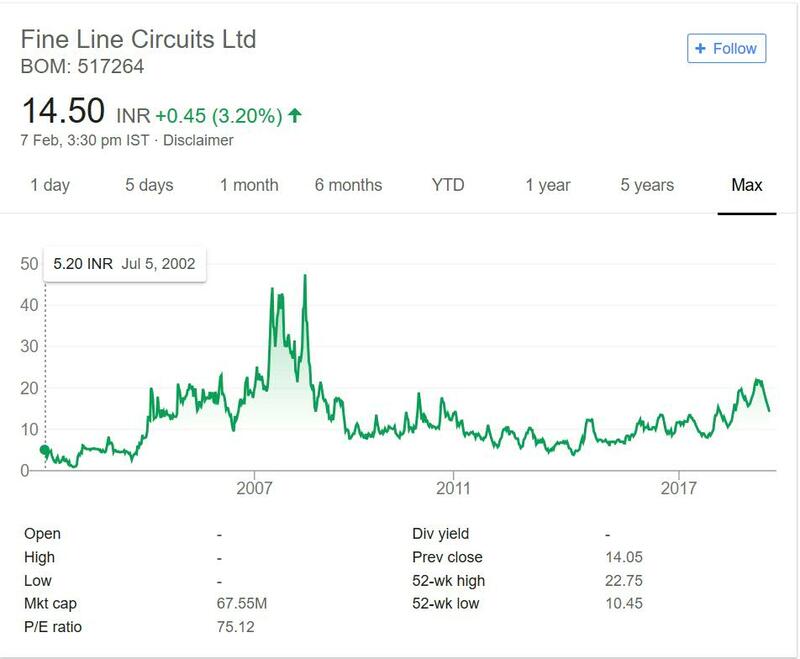 FineLine Circuits Ltd. is in portfolio of Subramanian P. He is one of the top investors in India. It can be categorized as Electrical Company. It is a 100% EOU (Export Oriented Unit) Printed Circuit Board manufacturing company . Currently it has installed capability of 2500 sq ft of Single, Double-sided & Multilayer PCBs per day as per Company website. In year 2002 the Company was trading near 5 INR mark. It gave 10 times return in next 5 year period which is phenomenal performance by any standard. The journey was halted by 2008 global crisis. It made stock to trade around 10 INR mark still 2 times more than 2002 levels. From that point onward it has not performed well and hovered around 10 mark. Currently it is trading around 15 INR giving 3 times return to investors. Though company has not destructed wealth of investors but have only given decent returns. FineLine Circuits is 100% export oriented company. US is the main market or can say only market which Company is focusing on. It has only one office outside India present in US. Dependence on single country or market for any Company is not good. It should leverage the growth in Indian market as well. Any regulatory change in US will impact the Company hard. I would love to see it expand its presence in Europe and other countries and leverage Indian market opportunity. If it does it then stock prices will have positive impact else it is tough for Company to give decent returns to investors going forward.